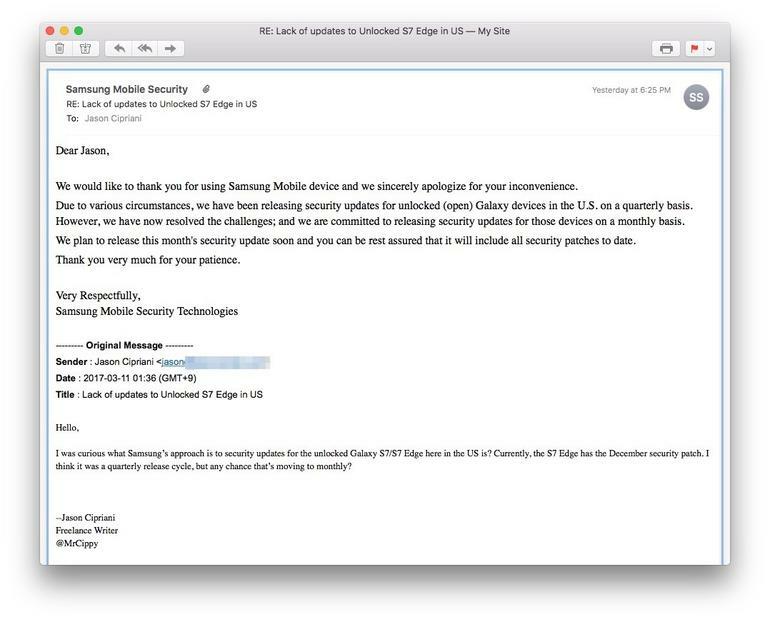 Unlike in most other regions, updates from Samsung have been reaching unlocked variants of its range of Galaxy smartphones later than the carrier-locked versions. This was a cause for frustration and contempt for those who bought unlocked flagship devices like the S7 and S7 Edge at a premium price. Although they did get less bloatware and the obvious freedom of switching to any network they want, most updates ended up being infrequent and later than even their carrier counterparts. Once you consider that Android 7.0 Nougat has not yet landed on the unlocked S7 and S7 Edge in the US, while all major carrier versions have received it, the reasons for those frustrations become apparent. All that is about to change, according to a conversation between ZDNet and Samsung Mobile Security. It is to be noted that this reply is the same as the one received by one of the site's readers earlier to a similar query (screenshot above). At this time, it expected that the soon to be released March security update for the unlocked S7 and S7 Edge will come with the belated Nougat upgrade package. Let's hope what we are reading here is true and Samsung is able to follow up on that promise. In the meanwhile, head over to our firmware section to find all the latest available updates for your Samsung smartphones.